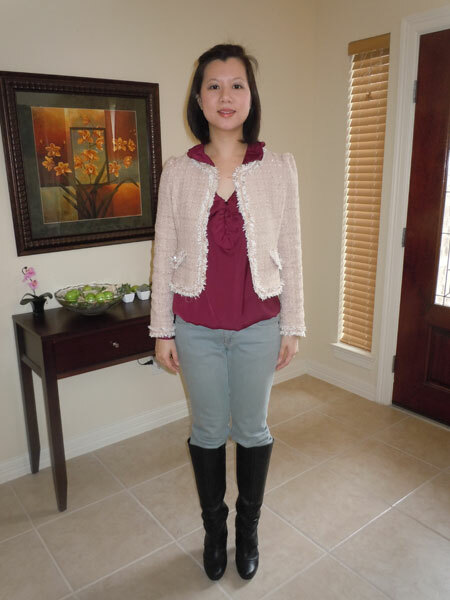 After Jean from Extrapetite.com reviewed her MyUniqueen.com Malang Tweed (Boucle) Jacket, I was determined to get one. Why? Because I always wanted a ladylike jacket and I have been burned before by buying one I thought would look good (Ann Taylor Loft Tweed Jacket with Studs). So when I got my Tweed Jacket from Uniqueen, I was sad to see that the Small size did not fit. It fit everywhere except my arms. Yes, if I wear even a thin sleeved layer, the jacket becomes extremely tight and constricts my entire arm from wrist to shoulder. It was like stuffing my arms in plastic tubing. Very odd. I never had a problem with the arm holes of jackets or such. So I returned the jacket and ordered a Medium after consulting with Anna Cho from myuniqueen.com. In the meantime, my Yesstyle.com Tweed Jacket from StyleKelly arrived. Luckily I ordered a Medium and it fit. But there was a downside, it was too short! My tweed obsession keeps being twarted by my nitpickiness. Still I shot these photos, just to document. After seeing the pictures, I was pleasantly surprised at how well this jacket looked on me. 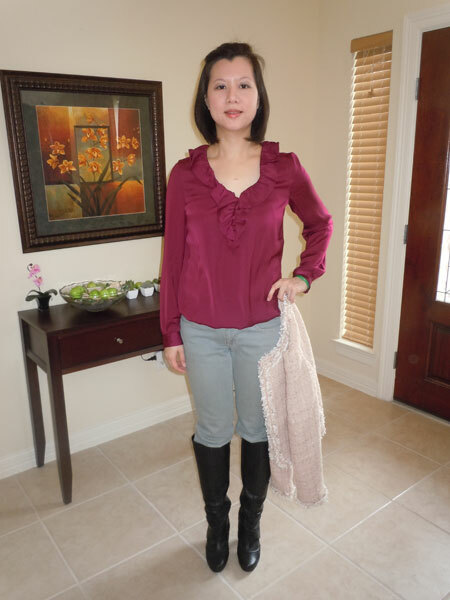 I love how my Ann Taylor Ruffle Poet Blouse’s collar adds a flirty flare to the outfit. Yesstyle.com’s description of jacket stated that it is a Beige color. 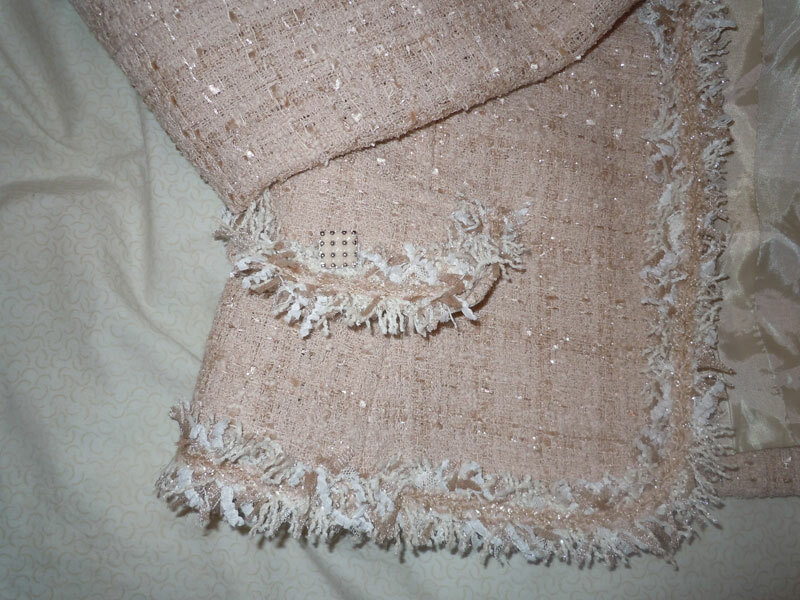 However, the picture (could be due to lighting or the shade of my blouse) showed a light pinkish hue that I really like. Even though the jacket does not have pockets, it had fun studded like hardware sewed where the faux pockets are. 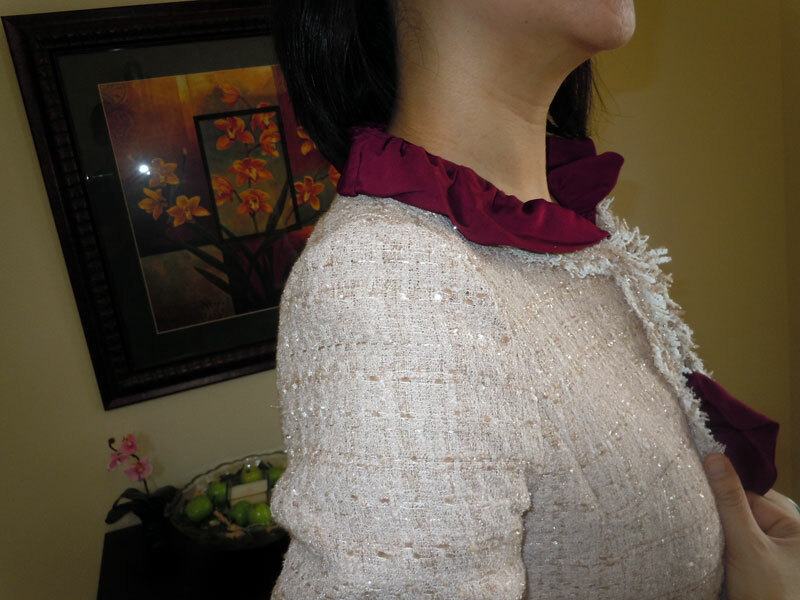 The jacket is lined in a shiny pink satin however it is very thin. I don’t think it would keep me warm at all during 40 degree weather like what Houston has been experiencing. The pictures were an eye opener to me. The jacket is on the expensive side at $150.00 and I even requested to return the item. However, looking at the photos I really like it. Hopefully I’m not making another serious mistake. It took me a week of contemplating. I kept taking the jacket out and pairing other outfits and I think it’s going to work out in the long run. Am I right to keep it? How would you pair this jacket? This post is a Color Brigade Challenge from CuteandLittle.com. If you like the outfit please vote for me here. love your tweed jacket girl!! !